Laptop and desktop repair. 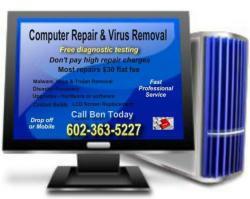 Free Diagnostic Testing. My name is Ben and about 80% of my services cost about $30 flat. No jokes, no games. If I do not fix the problem, there is no charge. My name is Kevin and I offer in home computer repair at reasonable rates. I guarantee all my work. You can reach me via E-Mail Kevinjr(at) or by ph --. Images and contact info on Advertigo website.